President Obama, shown here with Ben Bernanke in 2010, hinted that he will not reappoint the Federal Reserve chairman for a third term. 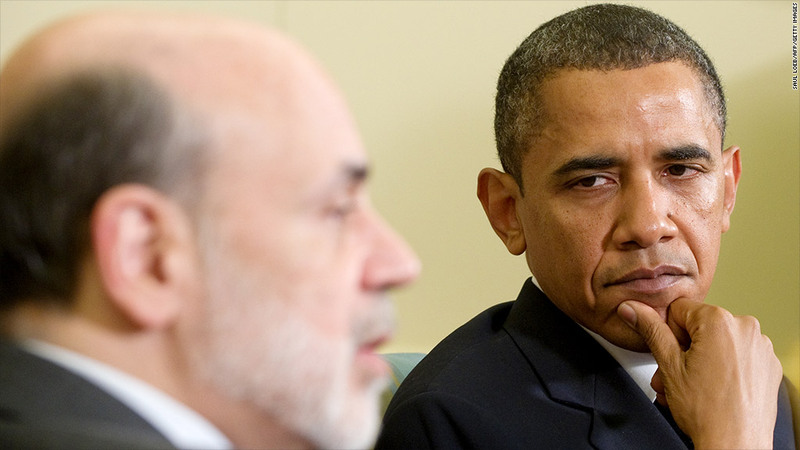 President Obama hinted Monday that he will not reappoint Ben Bernanke to a third term as Federal Reserve chairman. "He's already stayed a lot longer than he wanted, or he was supposed to," said Barack Obama in an interview with Charlie Rose, after the PBS host asked the president whether he planned to reappoint Bernanke after his term expires on Jan. 31, 2014. Obama did not answer directly when asked if he would reappoint Bernanke if the Fed chairman requested another term. "He has been an outstanding partner along with the White House in helping us recover much stronger than, for example, our European partners from what could have been an economic crisis of epic proportions," Obama said. Bernanke is scheduled to speak at a news conference Wednesday after the Fed completes a two-day policy meeting of the central bank. He is expected to discuss plans for the bank's bond-buying program. Bernanke has overseen the central bank's extraordinary response to the global financial collapse that began in earnest in fall 2007, keeping interest rates at historic lows and shepherding a massive Fed intervention in the government bond market. The fed funds rate, the Fed's key benchmark rate used to set the price of a variety of business and personal loans, stood at 4.5% when Bernanke took office, and rose as high as 5.25% that year. But the Fed started to cut rates in September of 2007 as the economy weakened. The Fed took rates down to nearly 0% in December, 2008. They remain in that range, between 0% and 0.25%. First appointed by President George W. Bush, Bernanke started as Fed chairman in February 2006. Obama kept him for a second term that started in 2010. His predecessor, Alan Greenspan, had the second-longest tenure of any Fed chairman, serving more than 18 years under four presidents. The average time for a chairman to serve is seven years, with half of them serving one term or less. Chris Isidore of CNNMoney contributed this story.